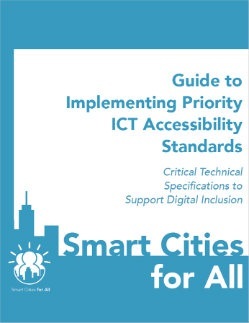 This short, concise guide was written as part of the Smart Cities for All project, but the content is relevant for any group (including national governments and other organizations) interested in implementing one or more of three Priority Standards: (1) The 2015 EU Standard (EU 301 549); (2) The 2017 US rules which revised Section 508; and (3) The 2008 Web Content Accessibility Guidelines (WCAG 2.0) from the World Wide Web Consortium. This guide introduces the background of each of the Priority Standards and why officials involved with (or responsible for) Information and Communications Technology (ICT) accessibility need to know about them. Next, the Standards are compared and their relationship to each other is explained. For implementation by officials, a checklist is provided. The guide provides a high level introduction to the Priority Standards. The actual details of what requirements must be met in the design of ICT is contained in each of the Standards themselves, linked to below.